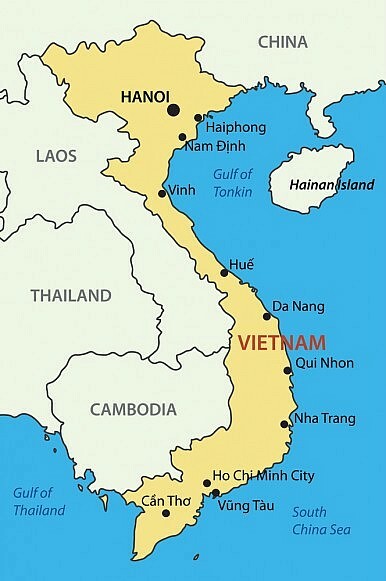 Fearing further riots, China and Taiwan are evacuating their citizens from Vietnam. A week after anti-China protests in Vietnam left at least two dead and over 100 injured, China and Taiwan are helping their citizens evacuate the country. The riots targeted foreign-owned factories and enterprises, mainly in the southern provinces of Binh Duong and Dong Nai. Many factories in those areas remained closed over the weekend. Despite these promises, China continued to evacuate its workers from Vietnam. Xinhua reports that over 3,500 Chinese nationals were evacuated from Vietnam via boat on Monday. Four ships, with a capacity of 1,000 passengers each, were sent to Vung Ang port specifically to pick up the Chinese citizens. Xinhua notes that most of the evacuees were employees of the Metallurgical Corporation of China, which was constructing a giant iron and steel complex in Vietnam. The steel plant, owned by Taiwan’s Formosa Plastic Group, was set on fire last week during the anti-China riots. Two Chinese workers were killed and 150 were injured, Lin Hsin-yi, chairman of Formosa Ha Tinh Steel Corp., told reporters. He estimated the total damage done to the steel plant at $3 million, and said construction would be delayed by one to two months. As part of the evacuation efforts, China has also sent chartered planes to Vietnam, including one with on-board medical facilities that brought back the Chinese nationals who had been wounded in the riots. Some Chinese citizens also left Vietnam for Cambodia, China’s Foreign Ministry said. The Foreign Ministry has warned Chinese citizens not to travel to Vietnam for the time being, causing many tourists to cancel their trips. Taiwanese nationals were also leaving Vietnam in droves, mostly through commercial airline flights. Taiwan’s major air carriers have added additional flights to help with the evacuation efforts. Taiwan’s Ministry of Foreign Affairs said that nearly 4,500 Taiwanese had left Vietnam for Taiwan as of noon on May 17. On Sunday, Vietnam’s representative to Taiwan personally apologized for the damage done to Taiwanese businesses, and said the government was looking into compensation. Possible avenues of compensation included lowering or removing taxes on affected businesses, forgiving existing loans, or offering new loans. One week after the riots, some factories were planning to reopen on Monday, while other would remain closed. According to Financial Times, foreign investors from all over the world were demanding that the Vietnamese government do more to prevent future violence. Official estimates were that almost 300 of around 950 foreign businesses in Binh Duong province were damaged during the riots, including 150 Taiwanese companies. Over the weekend there were fears of a second round of riots, as some Vietnamese were calling for anti-China protests on Sunday. This time, however, the Vietnam government moved quickly to disperse the gatherings. Witnesses told Reuters that protestors were arrested in Hanoi and Ho Chi Minh City “within minutes” of beginning their demonstration. Hanoi also sent out mass text messages to cell phone users in which Prime Minister Nguyen Tan Dung told people not to join the protests. It was a marked contrast to earlier protests, which the government had allowed to proceed unchecked. A commentary in Xinhua warned of the financial effects of the riots on Vietnam, including a loss of foreign investment if the security situation remains unstable. The article also noted that China has “sufficient economic leverage over Hanoi to protect its legitimate interests,” suggesting that China could apply economic sanctions should the anti-China protests continue. “China will consider taking further steps depending on how the situation plays out,” the Foreign Ministry said in a statement on Sunday. The statement also announced that China has suspended some bilateral exchange programs with Vietnam, although it was not clear specifically which meetings were affected. Vietnamese Vice President Nguyen Thi Doan still plans to attend this week’s Conference on Interaction and Confidence Building in Asia (CICA), which is being held in Shanghai.